Your car contains many hazardous materials, but did you know that its tyres are arguably the most dangerous? On their own, they don’t pose much of a physical or environmental threat, but if they are stockpiled illegally and catch fire, they can burn for days at extremely high temperatures. This puts lives at risk and can cause air pollution and severe disruption in the local area. In a recent well-publicised case, two company directors were jailed for storing waste tyres without a permit. The tyres had been stored at a site in Swansea and somehow caught fire. The resulting blaze lasted for twenty three days and the cost of dealing with the fire and removing the tyres was around £2.6m . For residents, the main problem with burning tyres is the prolonged effect on air quality in the local area. Burning tyres produce thick, black smoke that reduces the air quality significantly and poses a particular threat to people with breathing difficulties such as asthma. So if you thought your neighbours’ summer bonfires were bad, it could have been much worse! 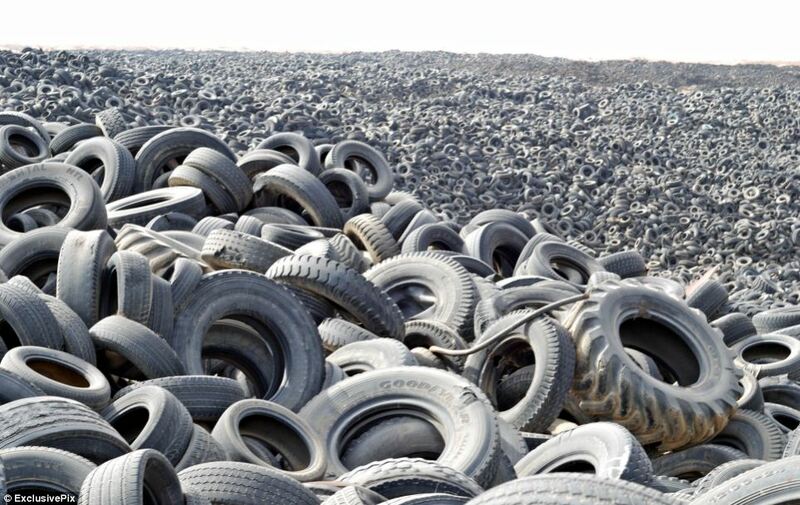 The way in which your car tyres are recycled will vary, depending on how the ATF that removes the tyres disposes of them. Some ATFs have arrangements with recycling companies that take the tyres, bale them, and then sell them on recycling specialists. Other ATFs provide the tyres to recycling specialists directly. When your car arrives at the Authorised Treatment Facility, the staff there will depollute the vehicle before it is crushed. The depollution process involves removing hazardous waste such as the oils and fuel in the car, and it also includes removing the tyres. The tyres are then stored safely. They will be collected by a tyre recycling company or a business that specialises in providing used tyres to the recycling industry (i.e. a middle man). When the tyres reach a recycling centre, they are fed into a shredder. This reduces the tyres to small strips. Tyres are not always shredded – some recycling centres have equipment that can take a tyre whole and turn it into Tyre Derived Fuel . But it is more common for the tyre to be shredded. Magnets and screens are used to separate the metals and fibres from the rubber in the strips of tyre. Some rubber is wasted as part of this process, but if the recycling facility has suitable equipment, this waste rubber can be recycled too. The metal and fibres are either bundled as they are or they are fed into a briquetting machine. This machine presses the material into a compact briquette, which is much more cost-effective to transport. The bundles or briquettes are then sold on to industry as a recycled material. The rubber strips are treated to remove any contaminants or dirt. The rubber strips are processed using specialist machinery to produce a 5mm rubber crumb, TDF (Tyre Derived Fuel) or rubber meeting another specification. The 5mm crumbs are used to create Astroturf for sports pitches and are used in construction and insulation too. TDF is used in many industries as a fuel source, including the concrete and paper industries , where it is used in kilns. If you would like to find out more about the tyre recycling industry and the equipment they use, visit http://www.bomaticuk.com. Would you Rather Keep Your Tyres? If you want to keep the tyres from your car, either because they are almost new or you want to recycle them yourself, that’s fine. But you will need to replace them with other tyres (old, worn tyres are okay to use). We need the car to have tyres so that it can be moved quickly and easily at the time of collection. If the tyres are missing, it makes it much more difficult to load your car onto our collection vehicle, and so this will affect the price we can pay.